Blog from Singapore, Singapore | Where is the Love? Unfortunately our flight from Sydney to Singapore was delayed by over 6 hours resulting in a lot of hanging around the airport and an excess of complimentary pot noodles, banana cake and diet coke.Once on board the Quantas jumbo, we were then informed the personal in flight entertainment was not working, still at least they were serving dinner, hadn't eaten anything in ages.By this time tired and feeling a little sick the last thing we needed was a really bumpy flight…. One advantage of arriving in Singapore in the middle of the night was we had our bags and were through immigration in under 10 minutes.Straight into a taxi when we realised no public transport was in operation and dropped at our hostel door at 5:30am.Thankfully there was a night warden and we got into the hostel, a quick shower and a couple of hours sleep before been woken by Hannah for a full days sightseeing. Off we went. Firstly to Sentosa Island for the huge cable car, the Merlion statue and great views of the city.The whole city was very impressive. The streets, transport system and taxis, in fact everything was clean and the people really friendly.The sky scrapers were huge but only just towered above the enormous cranes at the container ship port.From the cable car we could see what looked like a traffic jam of container ships waiting to dock and load or unload their goods. From Sentosa we had a brief look around one of the gigantic shopping malls on Orchard road.These malls are crazy; you go in one entrance and come out the other side about four blocks away.This was no bad thing as they were all fully air conditioned and considering the temperature and in particular the humidity even I was happy to enter such a mecca for shoppers.A t-shirt was no longer going to last a week before a wash. In the afternoon we decided to catch a couple of hours at the famous Zoo before going on the night safari, which is basically the zoo in the dark.The Zoo itself was superb. 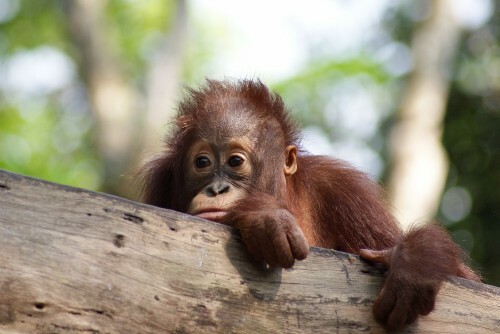 So many different species of animal, particular highlights being the orangutans and white tigers. From there we grabbed some Indian dinner before venturing on the night safari.Now the first part of the safari was the "Animals of the Night Show".All very entertaining until they produce a 6ft Boa constrictor fat as my leg onto the stage. The scene is set, out of the audience they want a big strong man to come on stage and hold it round their neck. They ask the audience of about 200 people if anyone is interested. Now you might remember that I have already chickened out of holding a far smaller snake in Australia, an act met with much teasing from Mrs Love. Thankfully a few men put them self forward and I sit a little easier in my seat, palms stop sweating etc. But then out of no where the girl running the show turns straight to me and says you sir get up here. No way! 200 people put the pressure on so I had to get up and put the enormous snake around my neck! If I was sweating before that was nothing now.I was asked a few questions, which I answered in a high pitched squeak, before Maggie and I became better acquainted. Not an enjoyable experience for me but Hannah seemed to take great amusement. The rest of the night safari was excellent.Tiger was amazing strutting around the large enclosure roaring. Also saw lion. Cheetah, loads of monkeys Hippos, elephants amongst lots of other animals.Quite tired and not getting back from the Zoo until late not much else was achieved that evening.The next day we made our way round the city centre and all the tourist hot spots.Raffels Hotel, landing spot, Merlion park, Chinatown, little India and the quays before making our way to the train station and the train to Kuala Lumpur. Pandora Singapore ! I'm on my second visit here and its such bfuutieal country.The national language is Malay and ENGLISH so don't worry about that The people speak at least 4 main languages ,English,Malay.Chinese and Indian and English is taught in all the schools so you should have no problem The country has so much to offer its visitors and the people are so friendly you'll love it .Fantastic transportation systems,top-notch attractions,bfuutieal river walk,got to be the greenest city in the world and its only 7 1/2 hours flight to Japan and the same to Australia so why not try all three.